It’s not yet certain whether European leaders will arrive at an agreement at today’s summit in Brussels, but what’s already clear is that Europe is running out of time. After two years of kicking the can down the road, contagion from the continent’s debt crisis has begun to infect Europe’s core. Indeed, the credit rating agency S&P recently threatened to downgrade the credit ratings of the entire Eurozone due to the increased risk of financial cataclysm. Increasingly, commentators are suggesting that only one European institution can possibly save the day: the European Central Bank. The ECB is, in fact, empowered to play a uniquely critical role in the crisis. But any hopes invested in it may ultimately be misplaced. The ECB is undoubtedly aware that it has significant influence over Europeans’ economic fate. But that doesn’t mean it shares with them a common notion of what a responsible course of action would be. Diagnosing Europe’s main problem isn't terribly difficult. Put simply, a slow-motion bank run is steadily engulfing the countries of the Eurozone, one that even Germany may not be immune to. And there’s only one straightforward way to end a bank run: throw money at it. Astronomical sums of money, if need be. That’s usually where central banks come in. Because they can print money, central banks can promise unlimited support to distressed institutions. That’s essentially what ended the banking crisis in the United States in 2009. Contrary to the conventional wisdom, the TARP bailout did not singlehandedly pull the economy back from the precipice. It merely bought time. By March of 2009, American banks were in worse shape than ever. It was only after the Federal Reserve started buying mortgage bonds from the banks (dubbed QE1), and certain accounting rules were relaxed, that the banks began to recover. This wasn’t quite an explicit statement of open-ended support, but it was a strong sign that the Fed would backstop the financial system, then and in the future. The ECB has been reluctant to countenance such unorthodox measures. At its most recent meeting, the ECB did introduce new rules and lending programs to reduce the strain on European banks, in addition to cutting interest rates to 1 percent—but those are just palliative measures. The underlying problem is the ruinous borrowing costs Europe’s periphery is paying to service its national debt. Not only do skyrocketing interest rates threaten to bankrupt countries like Italy, but they also threaten to bankrupt continental banks. European banks hold a substantial amount of European sovereign debt on their balance sheets. As sovereign interest rates surge, European banks take an implicit hit on their capital—a hit that increases the financial markets’ estimation that they will need to be bailed out. Of course, the specter that countries will have to bail out banks only pushes their borrowing costs even higher, beginning the cycle over again. And so on, and so on. The ECB has thus far refused to intervene on a large scale due to concerns over moral hazard: It doesn’t want to bail out, in its view, profligate governments. That’s why investors hope that if the Europeans can reach an accord on government spending and deficits, the ECB will feel emboldened to start throwing money at the crisis. Unfortunately, when the ECB has been willing to hint at flexibility, it’s been of the wrong sort. Some suggest that the ECB is preparing to lend money to a third-party, which would then, in turn, be tasked with lending it to European states. (A sort of quantitative easing via money laundering.) In one variation of this scheme, the ECB would lend to the IMF; in another the money goes to the EFSF (the temporary Euro-bailout fund); and in yet another it goes through the ESM (the forthcoming permanent Euro-bailout fund). The acronyms change, but the details remain the same. Why add a middleman? The answer: legal concerns. The ECB is barred from both directly buying the debt of member states and from printing money to recapitalize itself if it suffers losses. Loaning money to, say, the IMF would seem to get around these twin issues. Nothing would prevent the IMF from lending to Europe’s troubled economies, and the IMF would also spare the ECB from having to absorb any losses. The problems with this approach, however, are twofold. The first is that ECB chief Mario Draghi says this kind of legal chicanery isn’t kosher. Even if this were bluster—more on that in a bit—there’s still the problem that it might not actually lower the interest rates that debtor countries are paying. The problem is that supra-national lenders like the IMF are senior to other creditors: They always have to get paid back first. So if any European states do end up restructuring or defaulting on their debts, private sector bondholders will take the brunt of the hit. In that way, sovereign bonds will still look risky to investors, interest rates will remain elevated, and banks will remain vulnerable. So what could the ECB do to push down interest rates? One option is outright quantitative easing. In plain English, this means directly buying bonds from troubled countries. The ECB actually already buys bonds from Europe’s periphery, but only in nominal amounts. Scaling up that program should reverse the troubling trend of soaring interest rates on sovereign debt. An even surer way to bring down borrowing costs would be to simply announce a target for interest rates on, for example, Italian debt. If investors believe that the ECB is committed to hitting its target, the market will set interest rates at that target. After all, the ECB can theoretically marshal infinite amounts of money to buy bonds to hit its target. There’s no use in markets fighting a determined central bank. 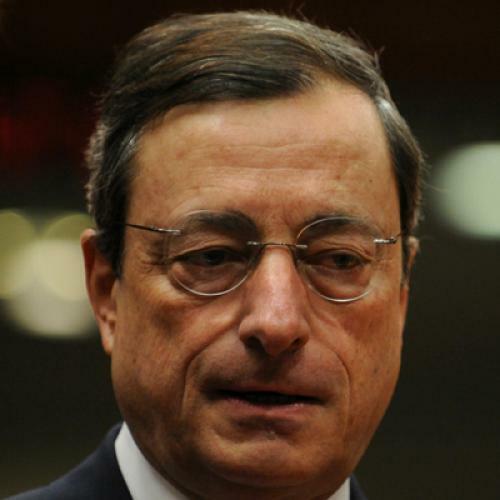 With a single sentence, Mario Draghi could potentially avert financial catastrophe. But one problem that would not solve is moral hazard, which is why Draghi says he’s refusing to consider it. Of course, there’s also always the possibility that Draghi’s intransigence is itself an instance of hard-nosed realpolitik. Both the ECB and the Germans have on occasion seemed to view high interest rates as salutary: They create incentives for peripheral governments to slash spending and enact labor reforms. By preemptively ruling out any measures to alleviate the crisis, Draghi sent interest rates back up—which, of course, reduces other leaders’ leverage to resist Merkel’s demands on fiscal matters. And that is why the ECB is likely to intervene—if at all—through a third-party like the IMF. A bailout that does not significantly or sustainably reduce interest rates—one that keeps indebted countries on life support without proactively helping them regain health—is perhaps the optimal solution in the halls of the ECB. This may all be a moot point anyway. Increasingly, it seems today’s Euro-summit will end in disappointment. Absent an agreement on strict controls over government spending, the ECB has promised to mostly sit on the sidelines. But the ECB is playing a dangerous game. For the sake of the world economy (and Europe’s banks), let’s hope nobody loses this particular game of chicken.